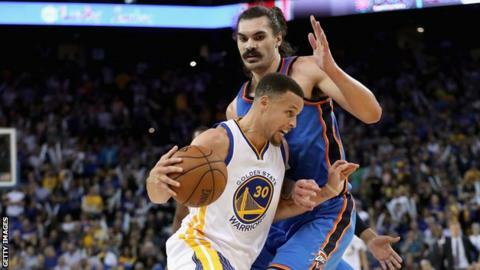 Oklahoma City Thunder centre Steven Adams has apologised for referring to the Golden State Warriors' players as "quick little monkeys". The New Zealander made the comment in a post-match interview after Thunder's victory over the Warriors in game one of the NBA Western Conference Finals. "It was just a poor choice of words," said Adams, 22, who scored 16 points in Monday's win. "I wasn't thinking straight. I didn't know it was going to upset anyone." The Thunder had been down by as many as 14 points but came back to stun the Warriors in the first game of the best-of-seven series. The Warriors set the NBA record for most wins in a regular season with 73 and have the league's most valuable player in Steph Curry, who scored 26 points against the Thunder. Adams, who moved to the United States to attend the University of Pittsburgh in 2012, blamed differences in dialect for his comments. "I was just trying to express how difficult it was chasing those guys around," Adams told USA Today. "Different words, different expressions, and stuff like that. But they obviously can be taken differently, depending on which country you're in. I'm assimilating, mate, still trying to figure out the boundaries. But I definitely overstepped them tonight." Adams, who is 7ft (2.13m) tall and has size 19 shoes, was born to a British father Sid, who served in the Royal Navy, and a Tongan mother. He is the youngest of Sid's 18 children with five different women. His brothers are around 6ft 10in to 6ft 11in, while his sisters stand at 6ft 5in to 6ft 6in. Six of his brothers have played basketball for New Zealand, while his half-sister is Valerie, 31, the double Olympic champion shot putter. Adams, who joined the Thunder in 2013, has become a cult hero for his moustache and sells his own moustache styling wax. Along with team-mate Enes Kanter, the pair are known as the Stache Bros.
Adams, who is from Rotorua in New Zealand's North Island, will not play in August's Rio Olympics, after ruling himself out of international duty.